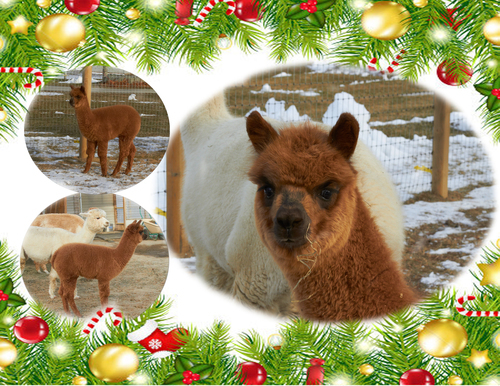 When we acquired Peruvian Lorenzo at the 2003 Breeder?s Choice Auction, we knew that he would be the male to make an immediate impact on our colored breeding program. He is now producing incredibly typey, Championship winning offspring! His Daughter, AG Midnight Rose won Color Champion and 1st place Bred and Owned Dark Female at the '06 Coastal Classic. The following weekend, she took Reserve Color Champion and 2nd place, Bred & Owned behind the Fawn Female Champion at the Empire Extravaganza. The judges remarked on her flawless conformation, her presence, and her beautiful, well nourished fleece with a soft handle and consistant character. Lorenzo's sire is 5Peruvian Black Ice, an outstanding black male retained by Phil Mizrahie, Pet Center, Inc. for his own private herd. He takes after his great sire in fleece density and excellent character and at two years old his AFD was a remarkable 17.1 microns! Black Ice has now passed away and there isn't much of that line out there. His dam, 5Peruvian Lozania, is the other reason why Lorenzo is so outstanding. Lozania is also the dam of Peruvian Logan, Peruvian Lenox, and Lethal Weapon, all of which have multiple blue ribbons and banners to their credit. Sumitra, or Sumi, as she's know on the farm is a charming girl with beautifully fine, soft. bright, shiny fiber. She has wonderful conformation, is a proven breeder and excellent mom. 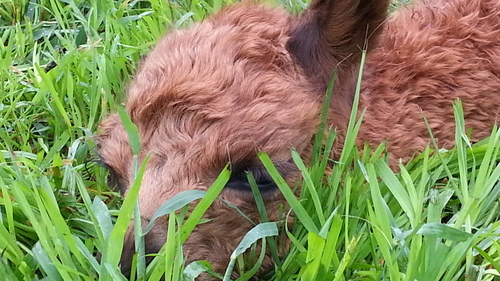 Sumi has given birth to 2 beautiful cria. 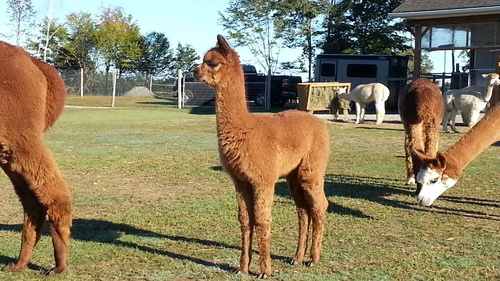 She comes from some of the top bloodlines, being the daughter of Spruce Ridge Zapata and granddaughter of Royal Fawn. She has a wonderfully gentle personality, is easy to handle and behaves very well on halter & lead. She produces some of the finest yarn you've ever seen. WOW! This new little addition to the farm is a beauty!! 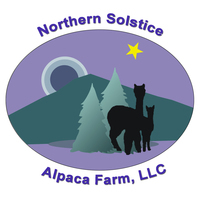 Coming from outstanding bloodlines - My Peruvian Lorenzo - a glorious Black Champion, & and Spruce Ridge Zapata daughter - N Solstice Sumitra...she's got it all! Adelaide has beautiful shades of reddish brown long fiber with amazing luster and brightness. She was born on August 31st, 2013, so she is very young and already showing the same incredible traits in both fiber and conformation that she took on from both parents. We will be posting fiber stats after her first shearing. We are seeing great potential in her breeding future. Call or email for more details.